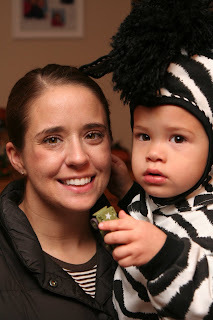 Connor had a great time with Halloween this year. 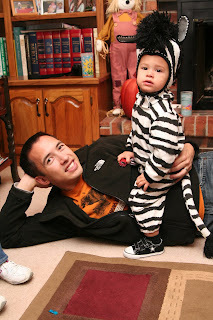 Andrea enjoys dressing him up while he doesn't really have a say in it and this year he went as a zebra. 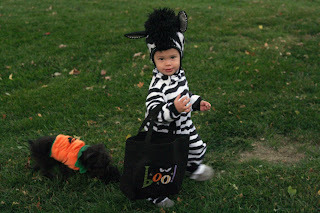 He has a weird fixation with zebras and he's got a little zebra toy that he likes us to chase him around with. 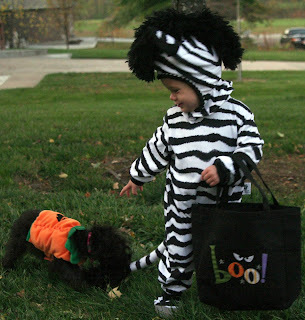 We have always made a "Shh Shh" noise with it when we chase him, and he is convinced that's the noise a zebra makes. 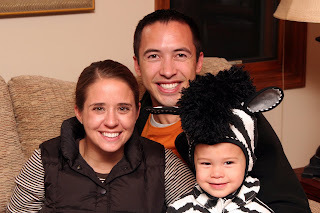 Connor went trick or treating with his cousins in Odessa and although he was terrified of Uncle Nate in the "Big Bad Wolf" costume (and every other costume), he did have lots of fun. 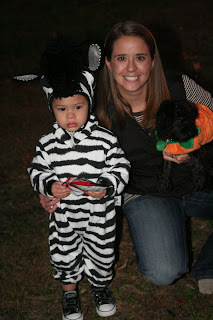 He was hesitant going up to houses, but he loved getting candy and said "Tick or Dee" when prompted. 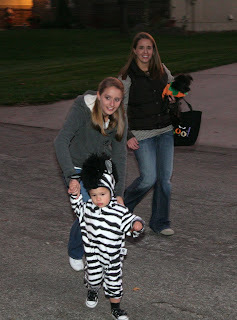 Sophie loved Connor's costume as well and loved to chase him around and would grab his tail. She was funny about it and would shake it and hold on like crazy. 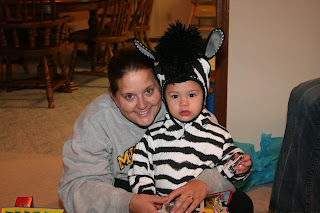 Thanks Aunt Abby for the Halloween presents!! He's been playing with Sarge (Cars movie toy) all day today. 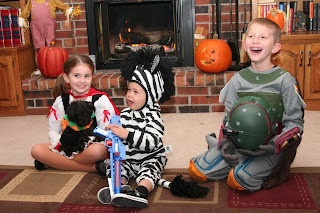 We tried to get a group shot of the kids, but Connor was terrified of Drew when Drew was wearing his helmet. We never did get a good picture of them together. I like it. 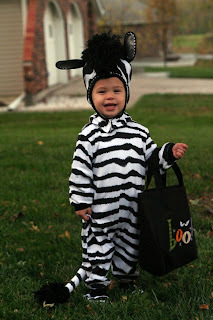 He always has such nice costumes!